Goodreads Synopsis: I’m the fat Puerto Rican–Polish girl who doesn’t feel like she belongs in her skin, or anywhere else for that matter. I’ve always been too much and yet not enough. Sugar Legowski-Gracia wasn’t always fat, but fat is what she is now at age seventeen. Not as fat as her mama, who is so big she hasn’t gotten out of bed in months. Not as heavy as her brother, Skunk, who has more meanness in him than fat, which is saying something. But she’s large enough to be the object of ridicule wherever she is: at the grocery store, walking down the street, at school. Sugar’s life is dictated by taking care of Mama in their run-down home—cooking, shopping, and, well, eating. A lot of eating, which Sugar hates as much as she loves. When Sugar meets Even (not Evan—his nearly illiterate father misspelled his name on the birth certificate), she has the new experience of someone seeing her and not her body. As their unlikely friendship builds, Sugar allows herself to think about the future for the first time, a future not weighed down by her body or her mother. Soon Sugar will have to decide whether to become the girl that Even helps her see within herself or to sink into the darkness of the skin-deep role her family and her life have created for her. 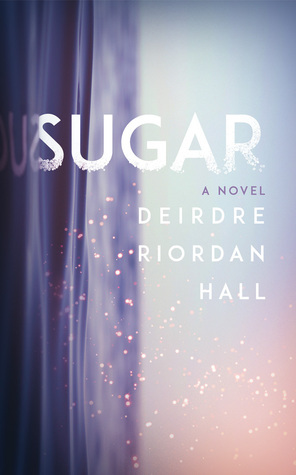 Sugar by Deirdre Riordan Hall was such a raw and beautiful book that bring into light topics of weight, image, and love. Hall wrote an amazing book that would captivate any reader into the main character, Sugar Garcia's journey in finding herself and falling in love. One element in the book I really liked was the unexpected twist towards the end of the book. It was definitely unexpected for me and I definitely did not see it coming! But be prepared for some water works when it comes! But I think the twist in the novel helped Sugar to move on with her life and embrace the person she became. Hall was able to shift the book to the realities of life and it helped make it feel more real and honest. I do wish the book focused more on the Sugar's family dynamic with her dad and mom, possibly with flashbacks into the past? Overall, Sugar, was a great, heartfelt book. Any reader would be able to easily pick up the book and read about Sugar's journey. Be sure to pick this great contemporary book now! (DIY) - Tumblr iPhone Cases! Easy & Simple! What's On My Reading Pile? !